Schools in England now have a good deal of operational freedom in exactly how they go about educating the students in their care. The quid pro quo for this autonomy is a strong system of accountability: if there is not going to be tight control over day to day practice, then there needs to be scrutiny of the outcome. So schools are held to account in terms of the results that they help their students achieve. The two central components are new measures of pupils’ attainment and progress. These data inform both market-based and government-initiated accountability mechanisms. The former is driven by parental choices about which schools to apply to. The latter is primarily focussed around the lower end of the performance spectrum and embodied in the floor targets – schools falling below these triggers some form of intervention. Dave Thomson at FFT and I were asked by the Department for Education (DfE) to help develop the progress measure and the accompanying floor target, and our report is now published. Two requirements were set for the measure, along with an encouragement to explore a variety of statistical techniques to find the best fit. It turns out that the simplest method of all is barely any worse in prediction than much more sophisticated ones (see the Technical Annex) so that is what we proposed. The focus in this post is on the requirements and on the implications for setting the floor. The primary requirement from the DfE for the national pupil progress line was that it be fair to all pupils. ‘Fair’ in the sense that each pupil, whatever their prior attainment, should have the same statistical chance of beating the average. This is obviously a good thing and indeed might sound like a fairly minimal characteristic, but it is not one satisfied by the current ‘expected progress’ measure. We achieved this: each pupil on whatever level of prior attainment an expected progress measure equal to the national average. And so, by definition, each pupil has an expected deviation from that of zero. The second requirement was that the expected progress measure be based only on prior attainment, meaning that there is no differentiation by gender for example, or special needs or poverty status. This is not because the DfE believe that these do not affect a pupil’s progress, it was explicitly agreed that they are important. Rather, the aim was for a simple and clear progress measure – starting from a KS2 mark of X you should expect to score Y GCSE points – and there is certainly a case to be made that this expectation should be the same for all, and there should not be lower expectations for certain groups of pupils. (Partly this is a failure of language: an expectation is both a mathematical construct and almost an aspiration, a belief that someone should achieve something). So while the proposed progress measure is ‘fair’ within the terms set, and is fair in that it sets the same aspirational target for everyone, it is not fair in that some groups will typically score on average below the expected level (boys, say) and others will typically score above (girls). This is discussed in the report and is very nicely illustrated in the accompanying FFT blog. There are plausible arguments on both sides here, and the case against going back to complex and unstable regression approaches to value added is strong. This unfairness carries over to schools, because schools with very different intakes of these groups will have different chances of reaching expected progress. (Another very important point emphasised in the report and in the FFT blog is that the number of exam entries matters a great deal for pupil performance). Now we come to the question of how to aggregate up from an individual pupil’s progress to a measure for the school. In many ways, this is the crucial part. It is on schools not individual pupils that the scrutiny and possible interventions will impact. Here the current proposal is more problematic. Each pupil in the school has an individual expected GCSE score and so an individual difference between that and her actual achievement. This is to be expressed in grades: “Jo Smith scored 3 grades above the expected level”. These are then simply averaged to the school level: “Sunny Vale School was 1.45 grades below the expected level”. Some slightly complicated statistical analysis then characterises this school level as either a significant cause for concern or just acceptable random variation. It is very clear and straightforward, and that indeed is its chief merit: it is easily comprehensible by parents, Headteachers and Ministers. But it has two significant drawbacks, both of which can be remedied by aggregating the pupil scores to school level in a slightly different way. First, the variation in achieved scores around expected progress is much greater at low levels of attainment than at high attainment. This can be seen clearly in Figure 1, showing that the variance in progress by KS2 sharply and continuously declines across the range where the bulk of pupils are. Schools have pupils of differing ability, so the effect is less pronounced at school level, but still evident. The implication of this is that if the trigger for significant deviation from expected performance is set as a fixed number of grades, then low-performing students are much more likely to cross that simply due to random variation than high-performing students are. By extension, schools with substantial intakes of low ability pupils are much more likely to fall below the floor simply through random variation than schools with high ability intakes are. So while our measure achieves what might be called ‘fairness in means’, the current proposed school measure does not achieve ‘fairness in variance’. The DfE’s plan is to deal with this by adjusting the school-level variance (based on its intake) and thereby what counts as a significant difference. This helps, but is likely to be much more opaque than the method we proposed and is likely to be lost in public pronouncements relative to the noise about the school’s simple number of grades below expected. The second problem with the proposal is inherent in simple averaging. Suppose a school is hovering close to the floor target, with a number of pupils projected to be significantly below their progress target. The school is considering action and how to deploy extra resources to lift it above the floor. The key point is this: it needs to boost the average, so raising the performance of any pupil will help. Acting sensibly, it will target the resources to the pupils whose grades it believes are easiest to raise. These may well be the high performers or the mid performers – there is nothing to say it will be the pupils whose performance is the source of the problem, and good reason to think it will not be. While it is quite appropriate for an overall accountability metric to focus on the average, a floor target ought to be about the low-performing students. The linear aggregation allows a school to ‘mask’ under-performing students with high performing students. Furthermore, the incentive for the school may well be to ignore the low performers and to focus on raising the grades of the others, increasing the polarisation of attainment within the school. The proposal we made in the report solves both of these problems, the non-constant variance and the potential perverse incentive inherent in the averaging. We combine the individual pupil progress measures to form a school measure in a slightly different way. 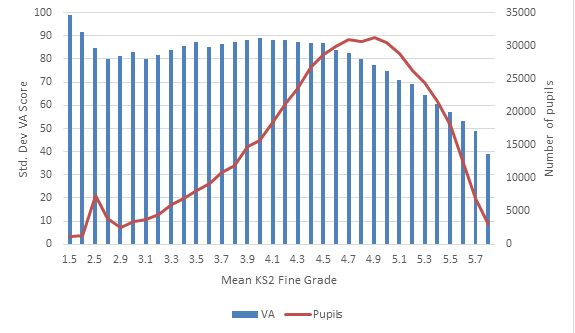 When we compare the pupil’s achievement in grades relative to their expected performance, we normalise that difference by the degree of variation specific to that KS2 score. This automatically removes the problem of the different degree of natural variation around low and high performers. We then highlight each pupil as causing concern if s/he falls significantly below the expected level, and now each pupil truly has the same statistical chance of doing this. The school measure is now simply the fraction of its pupils ‘causing concern’. Obviously simply through random chance, some pupils in each school will be in this category, so the floor target for each school will be some positive percentage, perhaps 50%. We set out further details and evaluate various parameter values in the report. The disadvantage of this approach for the DfE is that the result cannot be expressed in terms of grades, and it is slightly more complicated (again, discussed in the report). This is true, but it cannot be beyond the wit of some eloquent graduate in government to find a way of describing this that would resonate with parents and Headteachers. At the moment, the difference between the two approaches in terms of which schools are highlighted is small, as we make clear in the report. Small, but largely one way: fewer schools with low ability intakes are highlighted under our proposal. But there are two reasons to be cautious. First, this may not always be true. And second, the perverse incentives – raising inequality – associated with simple averaging may turn out to be important. It is known that the children who are the youngest in their class tend to do worse, in several respects, than their classmates. On average, they do less well academically throughout their school careers and are less likely to attend university. They have also been found to be less confident in their academic ability and are more likely to report being bullied or unhappy at school, and they are less likely to participate in both youth and professional sports. Given this, it is perhaps not surprising that these children are also more likely to have mental health problems: they are more likely to be diagnosed with attention disorders, learning disability and dyslexia. Still, little is known about the consequences for health service provision, and in particular the extent to which these children are over-represented as users of specialist mental health services. In a paper forthcoming in the Journal of Clinical Psychiatry, Shipra Berg and Erlend Berg investigate whether August-born children, who are the youngest in their class in the English educational system, are over-represented in referrals to specialist Child and Adolescent Mental Health Services. The threshold for referral to these services is relatively high, since minor problems are often dealt with by school health workers or family doctors. The research method is simple. The cut-off date for school entry in England is 1 September. So a child born in August will be among the youngest in his or her class, while a child born in September will be one of the oldest. The researchers obtained dates of birth for all children referred to mental health services in three boroughs of West London for a period of four years, and compared the frequency of birth months of the referred children to the birth-month frequencies in the population. For example, children born in September represent 8.6% of the population but only 8.0% of referrals. Hence they are 7.3% less likely to be referred to mental health services than the average child. For August-born children the situation is reversed. Of all children referred to mental health services, 9.4% were born in August. But only 8.6% of the population of children in the relevant age group are born in August. That means that August-born children are 9.1% more likely to be referred than the average child, and 17.8% more likely to be referred than their September-born classmates. These figures are statistically significant, meaning they are very unlikely to be caused by random fluctuations in the data. When boys and girls are examined separately, the main findings are confirmed for both sexes. Children in the UK start school at a particularly young age, so an age difference of one year is substantial. The September-born child, who starts school around her fifth birthday, has had a 25% longer life experience than the August-born child, who starts school around his fourth birthday. Clearly, a one-year age difference shrinks as a proportion of life experience as the children grow up. One might therefore expect that the negative effect of being the youngest wears off over time. However, the authors find that the main effect holds for children of both primary-school and secondary-school age. This could mean that being the youngest is detrimental even in secondary school, or alternatively that the disadvantage of being the youngest in primary school has lasting consequences. It is, in principle, possible to defer a school start to the term (there are three terms per year) in which the child turns five. However, this is rarely practised, because the child would still join the same class they would have been in had entry not been deferred. Deferring entry can therefore mean falling behind in academic and social development even before starting school. It is worth pointing out that a large majority of children born in August are not referred to mental health services. Other factors, including the children’s home environment, are likely to be more important determinants of mental health than month of birth. Still, August-born children, being the youngest – physically, emotionally and intellectually – in their class, may be more vulnerable than their older peers. A lot of research for education policy is focussed on evaluating the effects of a policy that has already been implemented. After all, we can only really learn from policies that have actually been tried. In the realm of UK education policy evaluation, the hot topic at the moment is the use of randomised control trials or RCTs. In this post I want to emphasise that in schools in England we are in a very strong position to run RCTs because of the existing highly developed data infrastructure. Running RCTs on top of the census data on pupils in the National Pupil Database dramatically improves their effectiveness and their cost-effectiveness. This is both an encouragement to researchers (and funders) to consider this approach, and also another example of how useful the NPD is. A major part of the impetus for using RCTs has come from the Education Endowment Foundation (EEF). This independent charity was set up with grant money from the Department for Education, and has since raised further charitable funding. Its goal is to discover and promote “what works” in raising the educational attainment of children from disadvantaged backgrounds. I doubt that anywhere else in the world is there a body with over £100m to spend on such a specific – and important – education objective. Another driver has been the Department for Education’s recent Analytical Review, led by Ben Goldacre, which recommended that the Department engage more thoroughly with the use of RCTs in generating evidence for education policy. It is probably worth briefly reviewing why RCTs are thought to be so helpful in this regard: it’s about estimating a causal effect. There are of course many very interesting research questions other than those involving the evaluation of casual effects. But for policy, causality is key: “when this policy was implemented, what happened as a result?” The problem is that isolating a causal effect is very difficult using observational data, principally because the people exposed to the policy are often selected in some way and it is hard to disentangle their special characteristics from the effect of the policy. The classic example to show this is a training policy: a new training programme is offered, and people sign up; later they are shown to do better than those who did not sign up; is this because of the content of the training programme … or because those signing up evidently had more ambition, drive or determination? If the former, the policy is a good one and should be widened; if the latter, it may have no effect at all, and should be abandoned. RCTs get around this problem by randomly allocating exposure to the policy, so there can be no such ambiguity. There are other advantages too, but the principal attraction is the identification of causal effects. Of course, as with all techniques, there are problems too. The availability of the NPD makes RCTs much more viable and valuable. It provides a census of all pupils in all years in all state schools, including data on demographic characteristics, a complete test score history, and a complete history of schools attended and neighbourhoods lived in. This helps in at least three important ways. First, it improves the trade-off between cost and statistical power. Statistical power refers to the likelihood of being able to detect a causal effect if one is actually in operation. You want this to be high – undertaking a long-term and expensive trial and missing the key causal effect through bad luck is not a happy outcome. Researchers typically aim for 80% or 90% power. One of the initial decisions in an RCT is how many participants to recruit. The greater the sample size, the greater the statistical power to detect any causal effects. But of course, also, the greater is the cost, and sometimes this can be considerable. These trade-offs can be quite stark. For example, to detect an effect size of at least 0.2 standard deviations at standard significance levels with 80% power we would need a sample of 786 pupils, half of them treated. If for various reasons we were running the intervention at school level, we would need over 24,000 pupils. This is where the NPD comes in. In an ideal world, we would want to be able to clone every individual in our sample and try the policy out on one and compare progress to their clone. Absent that, we can improve our estimate of the causal effect by getting as close as we can to ‘alike’ subjects. We can use the wealth of background data in the NPD to reduce observable differences and improve the precision of estimate of intervention effect. Exploiting the demographic and attainment data allows us to create observationally equivalent pupils, one of whom is treated and one is a control. This greatly reduces sampling variation and improves the precision of our estimation. This in turn means that the trade-off between cost and power improves. Returning to the previous numerical example, if we have a good set of predictors for (say) GCSE performance, we can reduce the required dataset for a pupil-level intervention from 786 pupils to just 284. Similarly for the school-cohort level intervention, we can cut back the sample from 24,600 pupils and 160 schools to 9,200 pupils and 62 schools. The relevant correlation is between a ‘pre-test’ and the outcome (this might literally be a pre-test, or it can be a prediction from a set of variables). Second, the NPD is very useful for dealing with attrition. Researchers running RCTs typically face a big problem of participants dropping out of the study, both from the treatment arms and from the control group. Typically this is because the trial becomes too burdensome or inconvenient, rather than on principle because they did sign up in the first instance. This attrition can cause severe statistical problems and can jeopardise the validity of the study. The NPD is a census and is an administrative dataset, so data on all pupils in all (state) schools are necessarily collected. This obviously includes all national Keystage test scores, GCSEs and A levels. If the target outcome of the RCT is improving test scores, then these data will be available to the researcher for all schools. Technically this means that an ‘intention to treat’ estimator can always be calculated. (obviously, if the school or pupil drops out and forbids the use of linked data then this is ruled out, but as noted above, most dropout is simply due to the burden). Finally, the whole system of testing from which the NPD harvests data is also helpful. It embodies routine and expected tests so there is less chance of specific tests prompting specific answers. Although a lot about trials in schools cannot be ‘blind’ in the traditional way, these tests are blind. They are also nationally set and remotely marked, all of which adds to the validity of the study. These do not necessarily cover all the outcomes of interest such as wellbeing or health or very specific knowledge, but they do cover the key goal of raising attainment. In summary, relative to other fields, education researchers have a major head start in running RCTs because of the strength, depth and coverage of the administrative data available. We are in the midst of a significant upheaval in the setting and marking of exams, and the reporting of school exam results. One feature of the system has been the centre of a lot of criticism and highlighted for reform: the focus on the percentage of a school’s pupils that achieve at least 5 GCSEs at grades C to A*, including the scores on English and maths. This is typically the most-discussed metric for (secondary) school performance and is the headline figure in the school league tables. The point is that this measure is based on a threshold, a ‘cliff-edge’. Get a grade C and you boost the school’s performance; missing a C by a lot or a little are the same, and just scraping a C is the same as getting an A*. This has been described as distorting schools’ behaviour, forcing schools to focus on pupils around this borderline. The argument is seen as obviously right and strong grounds for change. In this post I want to make two counter-arguments, and to suggest we are asking the wrong question. First a basic point. One central goal of any performance measure is to induce greater or better-targeted effort. This might just mean “working harder” or it might mean a stronger focus on the goals embodied in the measure at the expense of other outcomes. The key for the principal is to design the best scheme to achieve this. A very common scheme is a threshold one – this can be found for example in the Quality and Outcomes Framework for GPs, service organisations with a target number of clients to see, and of course schools trying to help pupils to achieve at least 5 grades of C or better. An organisation working under a threshold scheme faces very different marginal incentives for effort. Considering pupils: the most intense incentives relate to pupils just below the line: this is where the greatest payoff is to schools to devote the most resources. The first counter argument starts by noting that the asymmetry in the incentive is not a newly-discovered flaw, it is a design feature which can be very powerful. If there is a level of achievement that is extremely important for everyone to reach, then it makes sense to set up a scheme that offers very strong incentives to do that – that focusses the incentive around that minimum level. This is precisely what a threshold scheme does. So rather than simply pointing out that threshold designs strongly focus attention (which is what they’re supposed to do), the questions to ask are: is there some level of attainment that has that characteristic of being a minimum level of competence? And if so, what is it? If society feels that 5 grade C’s is a fair approximation to a minimum level that we want everyone to achieve, then it is absolutely right to have a ‘cliff-edge’ there because inducing schools to work very hard to get pupils past that level is exactly what society wants. It may be that we are equally happy to see grades increase for the very brightest children, those in the middle or those at the lower end of the ability distribution. Or not: all the main political parties express a desire to raise attainment at the lower end and narrow gaps. The argument should be about where to put the threshold, not whether to have one or not. Perhaps we are starting to see a recognition of this in the recent policy announcement that all pupils will have to continue studying until they have passed English and Maths. The second counter-argument is based on a scepticism of what is likely to happen without the 5A*-C(EM) threshold acting as a focal point. The core strategic decision facing a headteacher is how best to deploy her main resource: the teachers. Specifically: how best to assign teachers of varying effectiveness to different classes. It has been said that schools will be free to focus equally on all pupils. Well, maybe. Or perhaps we should think of the pressures on the headteacher, in this instance from teachers themselves. Effective teachers are very valuable to a school and any headteacher will be keen to keep her most effective teachers happy and loyal. It seems likely (I have no evidence on this, and would be keen to hear of any) that top teachers would typically prefer to teach top sets. If so, we might see a drift of the more effective teachers towards the more able classes in a school (and therefore on average, the more affluent pupils). The imperative of the C/D threshold gave headteachers an unanswerable argument to push against this. So threshold metrics have an important role to play in communicating to schools where society wants them to focus their effort. The current threshold, at 5 C grades, may or may not be at the right level; but discussing what the right level is, is a more useful debate to have. In these hard times, spending government money effectively is more important than ever. Last week Fraser Nelson challenged the effectiveness of spending in schools, one of the areas relatively protected from Coalition cuts. He said: “The biggest surprise, though, was the money: no matter how you split the figures, the amount spent didn’t seem to make the blindest bit of difference”, his reading of a report by Deloitte commissioned by the Department for Education. What is the evidence? In fact, it is surprisingly difficult to establish the impact of spending more money on student achievement. This is partly shortage of data (researchers always want more data), but there is a more fundamental reason too. Perhaps inadvertently, Fraser Nelson illustrated the difficulty in his first paragraph. He noted the variation in per-pupil expenditure “ranging from £4,500 in Lyme Regis to £10,000 in Salford.” This is absolutely right – there are very significant variations in revenue per pupil. But the key point is that these are not random: extra resources are explicitly and systematically directed towards schools in poorer neighbourhoods. The mechanism, accreting the new schemes of each successive government, may be incomprehensibly complex, but the intent is surely right. Getting back to our question, on the one hand we have this systematic distribution of resources towards poorer neighbourhoods. On the other hand we know that pupil attainment is typically lower in schools in such neighbourhoods; not for every pupil, not in every school, but on average. So if money has no impact on attainment, and we line up pupil attainment and school expenditure, we will tend to see a negative relationship. This derives solely from the way that money is distributed to schools. The fundamental problem is that there are two things going on with opposite effects: low attainment is associated with more money (via the schools funding system) and more money may be associated with high attainment (via the education process). With no other information, there is simply no way of disentangling these two opposing effects, and by itself these numbers can tell us nothing about the causal impact of school expenditure on pupil attainment. So the view that “the amount spent didn’t seem to make the blindest bit of difference” cannot be supported by this evidence. What of the wider research evidence, based on studies with a plausibly causal research design? One of the most prominent economists in the field of education, Rick Hanushek from Stanford, is famously sceptical of the value of greater resources for schools. There certainly are studies that show money can matter, but it is probably fair to say that the majority view among economists is that simply providing more resources for schools is not the best option. The really interesting question is this: why doesn’t more money raise attainment? More money usually helps most things. Either there simply is nothing that schools can buy that raises attainment. This seems unlikely, and would certainly be a surprise to parents paying many thousands of pounds to send their children to private schools. Or there are features of the system which lead schools to spending extra resources on the ‘wrong’ things – things that have little impact on attainment. This might be the manner in which the money is distributed by government (typically short-term, making long-term expenditure decisions risky); or the regulations and agreements governing its spending by schools; or other factors. We have speculated a little about this here. Coincidentally, the Department for Education has just opened a consultation on school efficiency – they await your views. There were some interesting comments on the recent post I wrote on profit-making schools. This post offers a brief reply to those points. It may be a solution to that problem, but it is not a necessary solution, there are other ways. The PFI programme has been funding capital spending on schools for over a decade now. Nor is it just a thing of the past: in 2011 Michael Gove announced capital expenditure through PFI of around £2bn to rebuild 300 schools. The latest estimates are that PFI expenditure on education will top £260m in 2012-13, and the whole programme has generated over £7bn for school building. The PFI obviously utilises the profit motive in the capital market to get funds into school building without needing profits in the schools themselves. It is certainly true that schools are unlikely to be making completely optimal decisions. Our own work shows a huge degree of heterogeneity in schools’ financial decisions which is very unlikely all to be optimal. So they certainly have scope for learning. And schools may be able to learn from each other: a lot of people interpret the success of London schools as down to ‘London Challenge’ – and a lot of people interpret the success of that to collaboration, to learning from other schools. In fact, we are in the design stage of a large-scale RCT to test this out. But the key point is that with the current system for school revenue, allowing profit-making provides incentives to reduce costs but no direct incentive to raise quality. So again profits might be a way of encouraging collaboration, but there are other, easier, ways of doing the same thing. The key here is the word “presumably”. Yes – this is the standard dynamic market process. If this worked in schools, then this would make choice and competition more effective in raising quality. But it does not appear to work well, as we described here. Understanding the best way to reform the revenue stream for schools to encourage expansion is the important part; profit-making may eventually be part of an incentive mechanism, but is currently tangential to the main problem. I’m an economist, I believe that incentives matter hugely. Indeed, many of the things that I write or say to the Department for Education involve the phrase “you need to make it matter more”. But that is about individual incentives: perhaps making the pay of Headteachers contingent on school outcomes, perhaps introducing some form of performance incentive for teachers. These people can raise quality, and can be rewarded for doing so. Within the present rules of the game, schools cannot be rewarded for raising quality, because the revenue they would receive is independent of quality. Clearly, profit-making schools can introduce individual performance incentives; but so can – and have – non-profit making schools. Again profit-making is a side issue. It’s the wrong battle to fight.